Recently declassified documents show that the US Air Force was working on, and perhaps had already built, a supersonic flying saucer in 1956. The aircraft, which had the code name Project 1794, was developed by the USAF and Avro Canada in the 1950s. 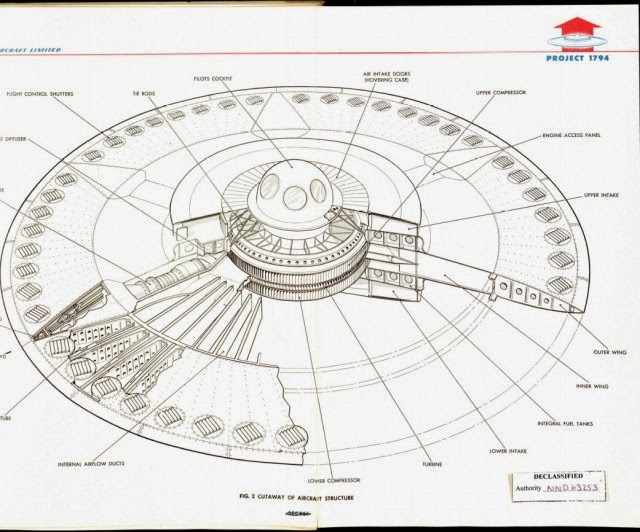 One declassified memo, which seems to be the conclusion of initial research and prototyping, says that Project 1794 is a flying saucer capable of “between Mach 3 and Mach 4,” (2,300-3,000 mph) a service ceiling of over 100,000 feet (30,500m), and a range of around 1,000 nautical miles (1,150mi, 1850km). 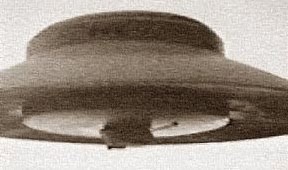 As far as we can tell, the supersonic flying saucer would propel itself by rotating an outer disk at very high speed, taking advantage of the Coandă effect. Maneuvering would be accomplished by using small shutters on the edge of the disc (similar to ailerons on a winged aircraft). Power would be provided by jet turbines. According to the cutaway diagrams, the entire thing would even be capable of vertical takeoff and landing (VTOL). These images come from the US National Archives, which is tasked with preserving important records and documents — including declassified military documents. It isn’t clear why it has taken some 64 years for Project 1794 to be declassified. This release does seem to follow on from the declassified news in 2008 that the US government has been monitoring UFO activity for more than 30 years. There are apparently two whole boxes of Project 1794 documents — but only the four images shown here have been digitized. Without a deeper look inside those boxes, we can’t be sure that Project 1794 ever made it off the ground. It’s worth noting that Avro Canada also worked on the VZ-9 Avrocar, though — which is basically the same as Project 1794, but a lot smaller. The Avrocar was originally specified for a max speed of 300 mph and a service ceiling of 10,000 feet — but in practice, it never got more than three feet off the ground or flew faster than 35mph. Many have argued that the fact that we use fixed-wing aircraft today is a good indicator that flying saucers, while cool, just aren’t that functional. 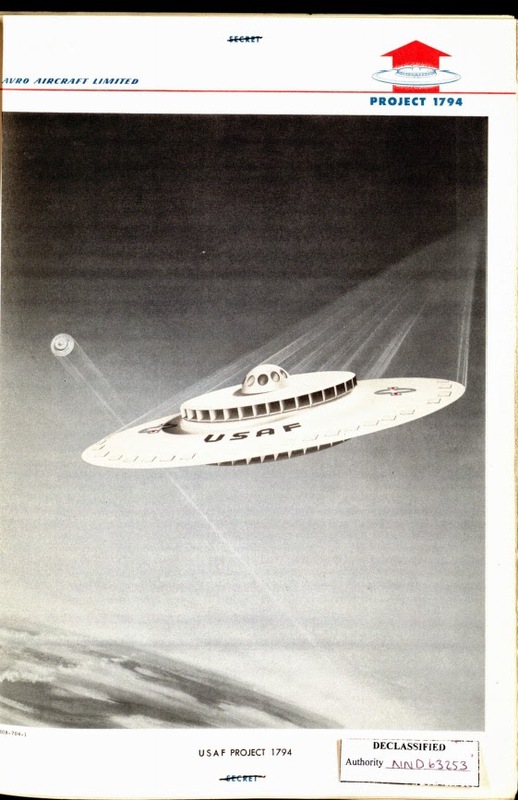 If flying saucers were somehow faster or more efficient or capable of lifting heavier loads, we would almost certainly see them in a commercial setting. That said, there are others who feel that the technology which makes these discs fly, first witnessed by WW2 pilots, is being suppressed in the name of US national security because of the alternative energy technology involved. 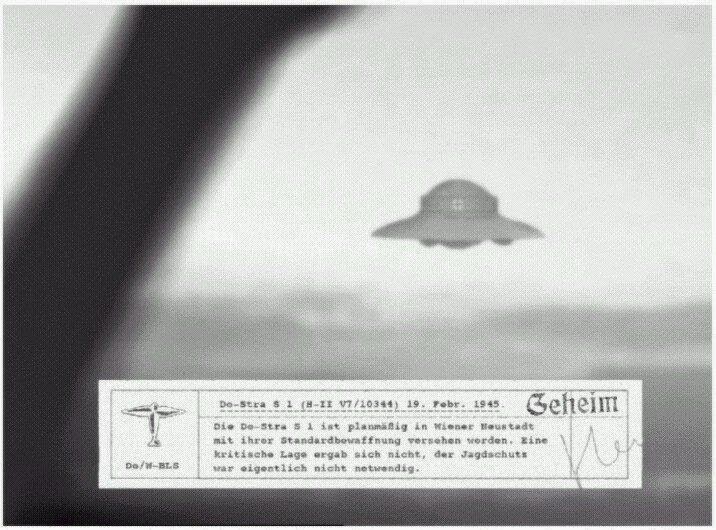 As such the very first disc project in Germany built in 1922 was not even an aircraft but an inter-dimensional flight machine in disc form- the JFM built by Thule-Vril. 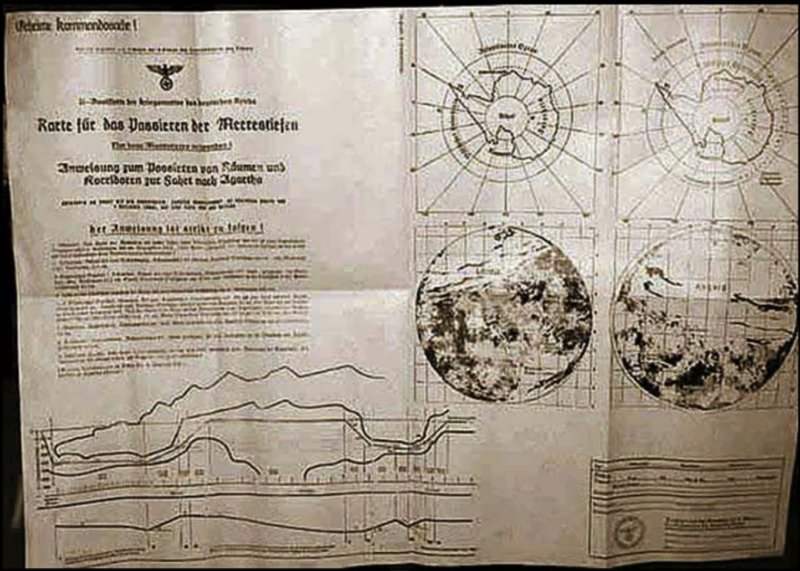 When Adolf Hitler (a Thule member along with Goering, Himmler, and various other top Nazi officials) became chancellor in Germany in 1933 the 11 year occult metaphysical science of Thule-Vril became strengthened by official state backing for the continued disc development programs starting with an RFZ (RundFlugZeug), or "Round Aircraft" series of discs that utilized levitators developed by W.O. Schumann of the Technical University of Munich who worked on the JFM. 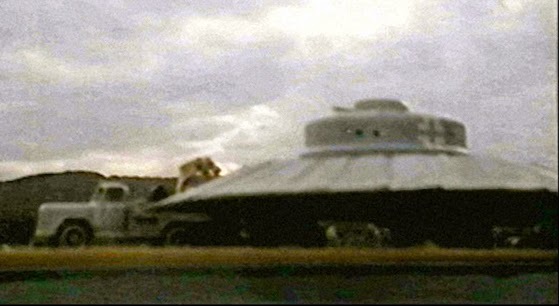 This unit was tasked with developing both the Haunebu and Vril disc designs that utilized the world’s first electro-magnetic-gravitic drive systems: the Vril and Thule Triebwerks. Many have often inquired why then when war started in 1939 did Germany not use these advanced and unique machines in air combat? The simple truth lies in the fact that these machines, despite their superior overall performance to conventional piston-engined aircraft and early jets, could not be realistically adapted to any useful military role other than the most basic transport and recon work. The strong EM engines were difficult to control and could not hope to imitate the flight characteristics of high performance fighters like the Me BF 109 or Fw 190. There was very little room for either offensive or defensive armament in these designs except for a few experimental light MG and MK cannons that proved impractical in flight and a rather large experimental Donar (Thunder) Kraftstrahlkanone (Strong Jet Cannon). These guns tended to destabilize the disc badly and were eventually removed. The disc bodies themselves were not capable of carrying any ordnance at all internally or externally (no bombs, unguided rockets, or missiles) and could only make turns of 22.5, 45, and 90 degrees. Due to round-the-clock bombing the SS was forced to try even more drastic measures, launching unmanned interceptor discs from the Schwarzwald. These discs were known as the "Feuerball" weapon, sometimes erroneously referred to as the mystery "V-7" weapon (of which there never was an official designation). The WNF Feuerball relied on a rocket motor for launch, a plume sensor for aerial detection, and an electrostatic filed weapon invented at Messerschmitt’s Oberammergau facility. Production of these craft was initially performed by WNF. Meanwhile, the Feuerball attacks that stopped in April 1945 in Germany resumed in August 1945 in Japan- an obvious technology transfer from Germany to Japan via U-Boat. The Japanese, however, lacked all the documentation for this weapon and only launched a few. It is said that the Japanese were frightened by this "demonic thing" and destroyed the remaining Feuerballs by dynamiting them in a pit. Photographic evidence also seems to identify "Kugelwaffen" sent to Japan as well as several are seen trailing Sally bombers, probably for flight testing. But the Third Reich story ends as strangely as it had begun. 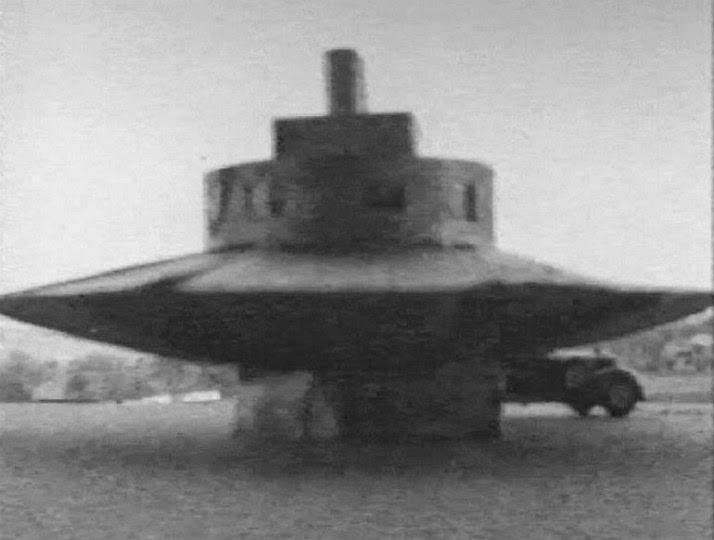 What about the mysterious Thule-Vril discs which were actually built in small numbers? 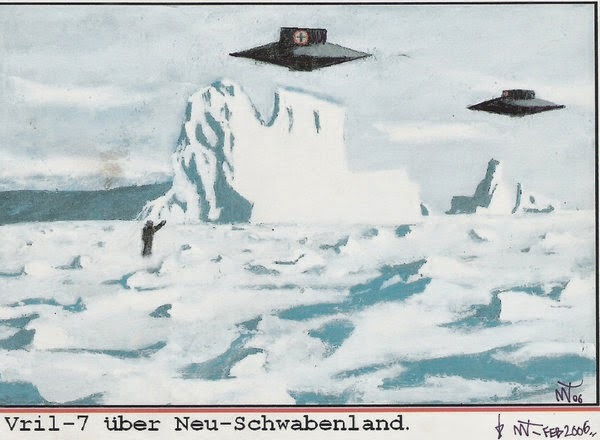 By 1945 there were quite a few Haunebu II and Vril 7 discs flying. Vril had even tested the Vril 8 Odin and possibly the even more streamlined Vril-9 Abjager. These craft were not destroyed but evacuated from March 1945 to an area safe from Allied bombing or capture. The base was supplied with slave laborers shipped by sea and U-boats to construct an elaborate cave complex deep within the mountains- an impregnable fortress. Hot internal springs were found there, iron ore deposits, vegetation and access was achieved primarily through an underwater trench that ran through. Ten thousand women between the ages of 17-24, blonde and well proportioned, were recruited for the project along with 2,500 Waffen SS soldiers serving in Russia. 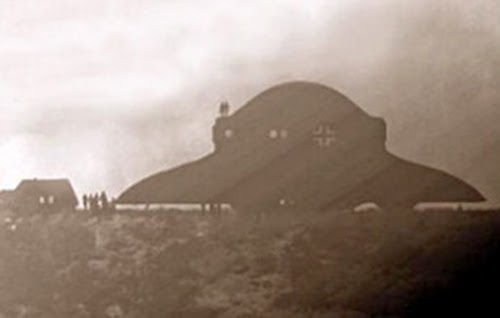 The goal of this massive undertaking was to create a colony at Base 211 suitable for habitation and continued development of the Thule-Vril technology. 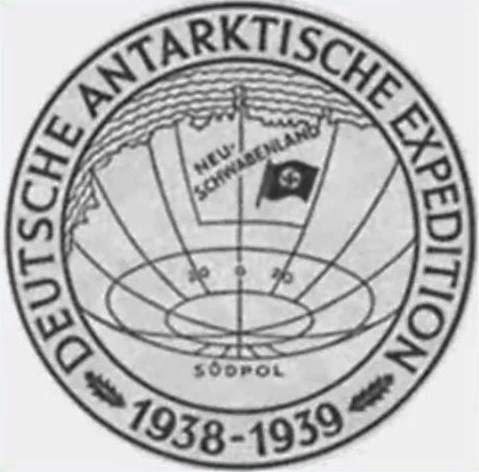 It is believed that both the Thule and Vril Gesellschafts evacuated that technology to Base 211 at the close of the war under SS General Kammler, who was in charge of Germany’s most secret weapons programs. 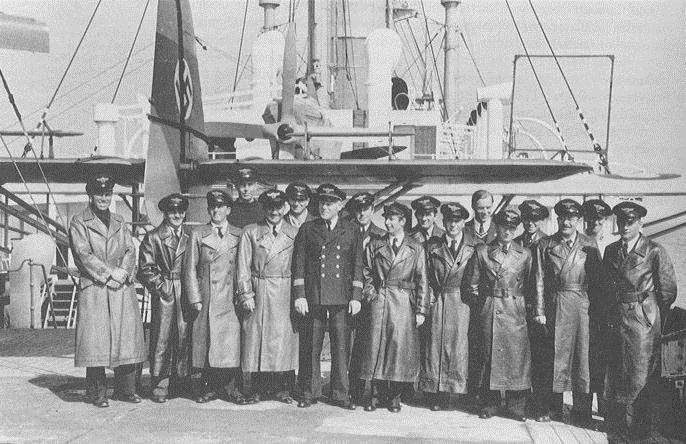 It became apparent in 1946 that 54 U-boats and over 6,000 technicians and scientists were ‘"missing" from Germany- especially from the SS Technical Branch. There were also 40, 000 slave laborers and between 142,000-250,000 German citizens unaccounted for. Despite simply writing these off as probable losses and deaths of the war, Washington suspected that a large number of these missing actually escaped to South America and Base 211 (if such a base existed). The US then went on a hunt using the "war criminal" propaganda to cover up the search for technology akin to a South American version of "Operation Paperclip". The United States was so concerned about the secret base that in 1947 with the first Antarctic summer "Operation Highjump" was launched with a full military task force headed by Admiral Byrd. The task forth was to head straight for Neu Schwabenland and recon the area for a base. If one was found 4,700 armed troops would have been sent to capture it or destroy it. The task force performed the aerial recon, trailing magnetometers to detect any magnetic anomalies under the ice… but several of Byrd’s planes were lost. The aircraft had run into enemy opposition. "Operation Highjump" ended in failure as Byrd headed back after several weeks, far short of the 8 months that was intended. In his unofficial comments to the South American press Byrd stated that he was attacked by "enemy aircraft" that "could fly from pole to pole at incredible speed". 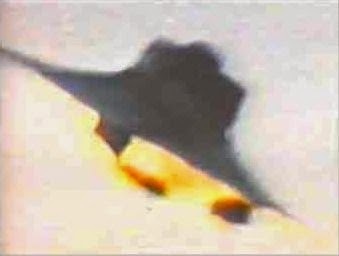 Subsequently, the modern UFO phenomenon sprang up in 1947 and concentrated disc development programs were initiated in the ‘50s that have continued on to present-day "black project" aircraft operated by the CIA, NSA, and NRO. So the story of the Third Reich disc programs does not end with the collapse of the Third Reich itself. Nice post a good German author of these flying discs is "Jan van Helsing" or "Jan Udo Holey"
While working in Boeing's Military Aircraft Division around 1970-73, my supervisor had a layout of the Project 1794 craft on his drafting desk in his office. I walked in one day, saw it, and he promptly covered the drawing and said I was not to know about it. I kept my eye open after that but never saw the drawing again. At the time we were working on Boeing's version of what became the F16.